Why Do Pep Guardiola's Teams Score Tons of Goals? Pep Guardiola's Manchester City scored 106 goals on their way to winning the 2017/18 English Premier League Championship. This was an incredible 38 goals more than runners up Manchester United. Pep Guardiola is the world's number one coach his teams win championships wherever he goes. His teams dominate possession and score an incredible number of goals. Guardiola has single handedly revolutionized soccer at the highest level. So much so that other top teams and coaches are attempting to copy his style and tactics. 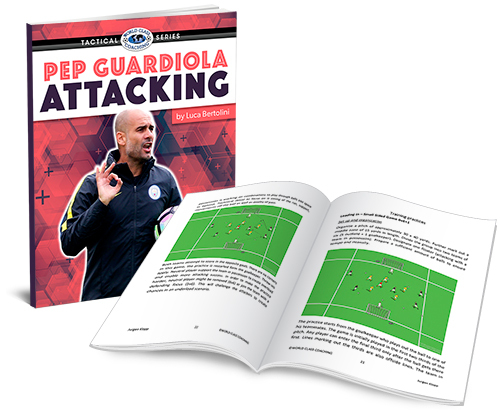 Pep Guardiola Attacking takes a look at how Guardiola coached teams manage to score an incredible amount of goals. It breaks down, formations, attacking shapes, counter-attacks and set plays so that you can use the same tactics with your team.